Yehuda Moon is an excellent cycling comic that was in production for a number of years. The team behind Yehuda Moon is currently on a break from making new comics but some of their complilation books are on sale for $7 each for a limited time. If you have never heard of Yehuda Moon and you are a cyclist now is a great time to pick up the first several volumes of this wonderful comic strip and start reading! You can purchase Volumes 1, 2 and 3 at a discount for a limited time here. I am signaling to turn left onto a residential street and there is a car approaching me in the oncoming lane of traffic to my left. They see me signaling to turn left so they stop in the middle of traffic to allow me turn left in front of them while they wait. As a cyclist my best defense on the road is to be as predictable as possible. That means following traffic laws...all of them. In the situation I just described above I have to yield to oncoming traffic when I turn left. When a car decides to yield to me (instead of me yielding to it) it does several things that put me in danger. 1) It confuses any cars that may be behind me in traffic. Remember, this is a very large and heavy vehicle that is traveling behind me. I don't want the driver of that car to be confused about what I am doing. I have already been signaling that I am preparing to turn left. So the car behind me is expecting me to yield to oncoming traffic (which means slowing down and sometimes coming to a complete stop) and to turn left. What if the car behind me is also turning left? Will they also try to turn in front of the same car? Maybe they will ride very close to me to try and squeeze through with me? These are all very non-standard activities which put me at risk. 2) The car that has stopped in the middle of the road to yield to me at the intersection has now confused any cars behind them. 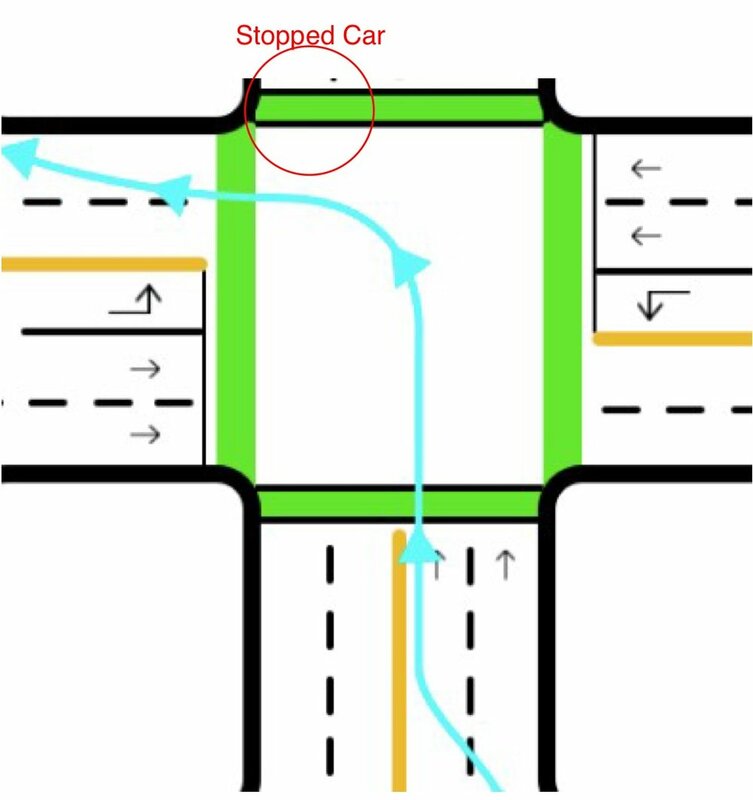 Most cars that see a car in front of them slowing down or stopping at a residential intersection assume the car is going to turn (regardless of whether the car has a turn signal on or not since it is common for people to not use them). Or even worse, they assume the driver of the car is lost or confused. Either way, the car approaching behind the car that is attempting to yield to me is now more likely to simply go around this stopped car instead of stopping behind it. If I were in the process of turning left when they went around the stopped car they would hit me before they even saw I was there. 3) Liability. If I turn left in front of an oncoming car in this situation I am now at fault for anything that happens anywhere in the vicinity. I have failed to yield to oncoming traffic and am therefore responsible for any accidents that may occur because of the situation. So if you have done the act of kindness I describe above for a cyclist on the road first let me thank you for the kind gesture. Cyclists really do appreciate it when cars go out of their way to try and make things safe for them. But in this situation I simply can't take advantage of the act of kindness. I wish I could stop in the middle of road and explain to every driver that does this why this is such a dangerous situation for me, but stopping in the middle of the road to chat is also dangerous. So I am writing the blog post instead. So if you see me out on the road there is one thing you can do that will help keep me safe...treat me like any other vehicle on the road. It is what other cars are used to seeing and it causes the least amount of confusion (making my actions on the road as predictable as possible). Cycling Web Comic Yehuda Moon is Back! My beloved daily ritual of grabbing a cup of hot joe and reading my favorite cycling web comic came crashing down several years ago when Rick Smith stopped producing the daily cycling web comic Yehuda Moon. Then last fall Rick Smith announced that Yehuda Moon was coming back and put out a Kickstarter Campaign. Rick announced that as part of campaign that he was writing all new comics, which the Kickstarter offered in a brand new Vol. 6 to be published this summer. And as promised, we now have an updated Yehuda Moon website where Rick is publishing daily web comics again. If you are an avid cyclist or even just somebody that enjoys getting out on your beach cruiser bike a few times a month, there are things in this comic that appeal to the entire cycling community.